I love rooster decor. I don’t love real-life roosters. But a giant bird crafted from ceramic and adorned in splashy primary colors? Sign. Me. Up. Steve does not share my rooster love. I’ve limited its expression in our house to a small spoon holder near the stove (that I expect to find “accidentally” broken any day now). Steve so dislikes my rooster trivet that he “forgets” to wash it when we clean up after dinner. I think he’s hoping I’ll just throw it away. What I love about rooster decor is the absurdity. I adore Beyonce, the 5′ rooster (How awesome would that look in our yard? And how much would it freak out THIS DOG?) There’s an oddly grim calendar featuring a year of Proud Roosters (which makes me wonder if anyone is working with the less confident roosters to help restore their swagger?) and another with 12 real-life chicken pics which gives me the shivers. And of course there’s the holy land for all of us who find ourselves inspired by this theme: Home Goods. Aisles upon aisles of rooster decor: statues and serving trays and wall hangings and dishes. Serving pieces and egg timers (morbid!) and even a set of little rooster spoons for no special purpose I can discern, other than to showcase more awesome rooster-ness. 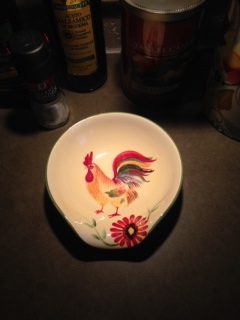 There is a corner in our kitchen pantry that needs a rooster. I’ve been planning it for months, looking for just the perfect (and by perfect, I mean profoundly ridiculous) rooster dude to preside over our flour and mixing bowls. I’ve walked the aisles of Home Goods, giddy with excitement that THIS is the season of life where I can let my rooster freak flag fly. I’ve even thought of names (they all start with F, for some reason.) And yet I’m stuck. As I look at this ocean of options, I can’t seem to pick just one. What makes the perfect rooster? I’m not sure. It’s one of life’s deep questions. I’m here to enlist your help. If you see AWESOME ROOSTER DECOR, will you send me a picture? Post it on Facebook or Twitter, send it via email. Tell me what you love about it. Let’s celebrate how strange we are here in America, that we have, among our many mixed blessings, an abundance of rooster decor options. This entry was posted in Stuff & Things and tagged Rooster decor on April 8, 2014 by Trish Ryan.